Introduced to resolve the problem of galaxy rotation curves, a variety of evidence (e.g. galaxy collisions, cluster dispersion velocities) currently suggests that some particle is associated with dark matter, and that dark matter makes up approximately 27% of the mass-energy density of the universe. Apart from that, most of our contemporary knowledge of what is now called ‘Cold Dark Matter’ (CDM) is about what it is not: it carries no electric or color charge, it is not part of the standard model of particle physics (a standard model that is arguably a lot better understood than CDM), and it is not (or very weakly) interacting. CDM is an essential component of ΛCDM, which works very well on large scales (>10 Mpc). At those large scales, predictions derived from the model match well with our current best observations of the universe. When moving to smaller scales (at most grant that SIDM could be a potentially interesting replacement, provided that it would hold up against severe testing (James Bullock pointed out a potential test). In any case, Popper would recommend dropping CDM and pursuing alternatives. Then why have cosmologists not followed Popper’s advice, despite often referring to Popper’s falsification criterion as a standard for ‘good scientific research’? Why is the question ‘What Would Karl Popper Do?’ the wrong question to ask about cosmological research? Why is CDM still part of the Standard Model of cosmology? Part of the reason of why this may seem surprising in light of the Popperian tale told above, is that that Popperian tale oversimplified the CDM/SIDM-story in many unwarranted ways. Time to rewind. Does ΛCDM really fail at (sub)galactic scales? The issue with the aforementioned ‘staple problems’ in astrophysics is that they are all born out of simulations: they all boil down to a mismatch between simulation outputs and observational evidence. 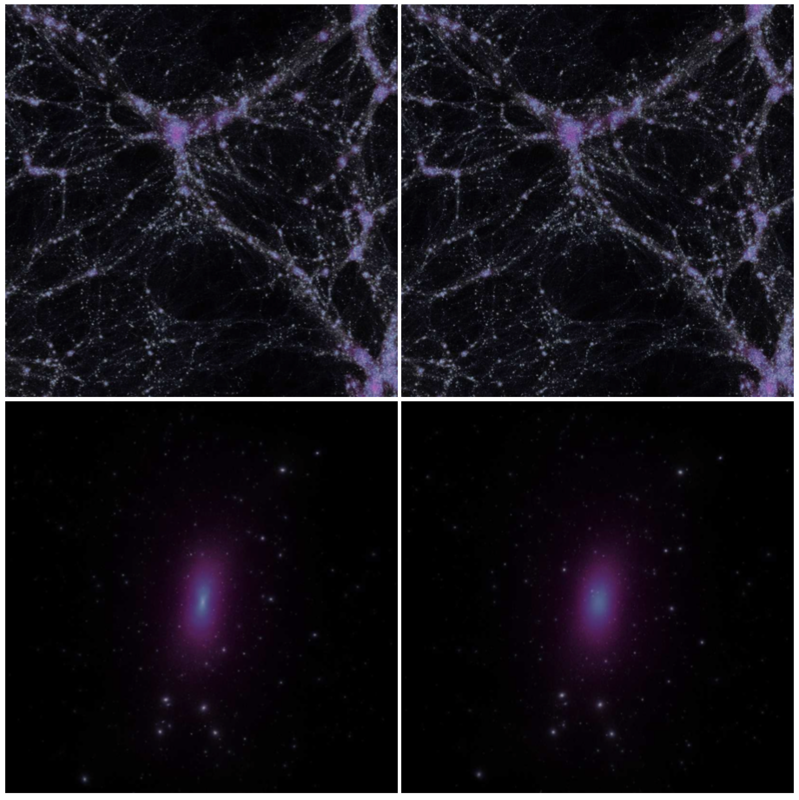 The role of simulations here is non-trivial: at (sub)galactic scales, cosmology is working in the non-linear regime, and deriving predictions from ΛCDM can only happen through the use of computer simulations. These simulations require the use of numerical techniques, as well as an array of simplifying assumptions (e.g. the exclusion of baryonic physics). The central role of simulations in astrophysics complicates the Popperian tale told above. In particular, it is unclear where the mismatch between observations and predictions originates: ΛCDM, numerical methods, simplifying assumptions etc. Thus, Popper and falsification are of very little help to (philosophers of) cosmology. Nonetheless, plenty of work remains for other philosophers of science when it comes to the CDM/SIDM-debate, in areas of which many were touched upon during the Irvine conference. First, questions arise about the nature of cosmological simulations. Eric Winsberg and Frank van den Bosch both cautioned against over-enthusiastic conclusions based on computer simulations that cannot be validated and verified. Although validation and verification are almost impossible to achieve in current cosmological simulations due to issues related to scales, alternative strategies may still be available to establish the epistemic reliability of simulation outputs that approximate validation and verification. Future philosophical work will have to explore the epistemic pay-off from each of these strategies. Of particular interest is how the epistemology of simulation has been worked out in context of climate science, and to what extent lessons from climate science carry over to cosmology. Second, and related to the first area, is the fact that cosmological simulations will most likely always have to deal with pragmatic constraints on computing power, observations, etc. Frank van den Bosch suggested possibilities to attempt to move around these constraints, for example by targeted use of complementary semi-analytic simulations. In light of pragmatic constraints, choices will have to be made as to which simulations should be run. Philosophers of science could explore the epistemic and pragmatic benefits and drawbacks of those different choices. Third, cosmologists’ and astrophysicists’ ambitions may have to be altered. Although Popper’s falsification has turned out to be quite problematic from a philosophical point of view, the fact that it is unhelpful in contemporary cosmology may still reveal something about current scientific practice: a lot of the research is still exploratory, in that it is still attempting to formulate different potential scenarios. In other words, the space of possible theories and hypotheses is being created, and the SIDM/CDM-debate is not actually a debate between two mutually exclusive and combined exhaustive hypotheses; rather, it is an attempt at explicating different possible explanations of current observations. Although the situation in cosmology may change overtime, Popper, for now, will have to stay out. 1This post was inspired by the presentations by James Bullock, Manoj Kaplinghat, Frank van den Bosch and Eric Winsberg. Image credit: Rocha, Miguel, et al. “Cosmological simulations with self-interacting dark matter–I. Constant-density cores and substructure.” Monthly Notices of the Royal Astronomical Society 430.1 (2013): 81-104.